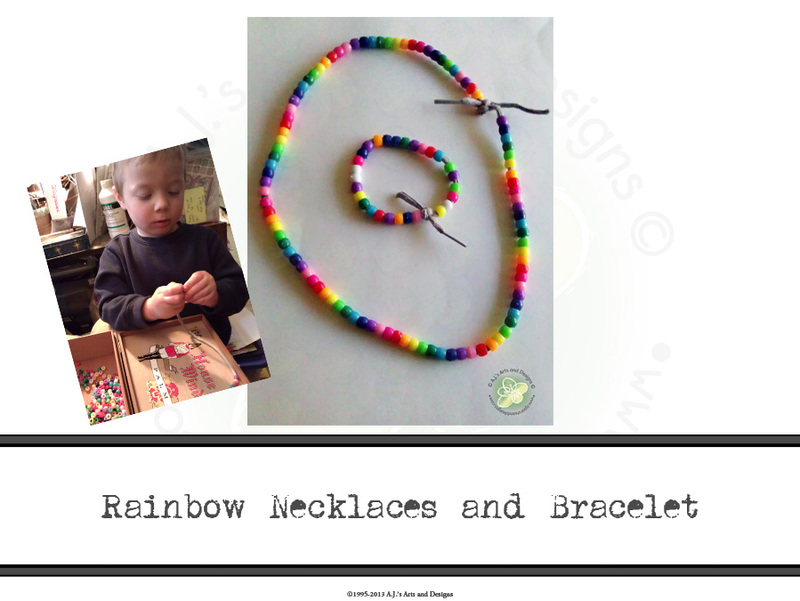 Rainbow Necklaces and Bracelets | Who Are You Calling Crafty? I have been trying to get Booga a little more active in the arts and crafts because I find myself comparing what I did with the Princess to what I have done or not done with Booga. The biggest difference between the two is the Princess was far more interested and listened far better than Booga. Booga has the attention span of a three year old boy which means the littlest thing distracts him. I have slowly been experimenting with items he would like create with here is his list: paints, crayons and markers only if trains are being colored, buttons, coins, bottle caps and he loves empty spools. Painting with Booga usually means I need to strip him down to his underwear (sometimes I throw an old t-shirt over him and let him go. He loves it, I however don’t like the mess. Booga found some old shoelaces and got into the pony beads this morning. At first I was upset but then I watched him as he tried to string the beads onto the shoelace. He was happy and wanted to make something. I dropped what I was doing and helped him. The first thing I did was empty the packet of beads into a box so he could easily pick them up. I then showed him how to thread the beads onto the shoelace and then I let him do it. *Optional but makes finding beads much easier. A nice easy craft for an impatient three year old. If you really want to pick the colors just put those colors in the box and have them string away or make a pattern on a sheet of paper and have them copy it.